Trendy charred food: Is it worth the risk? 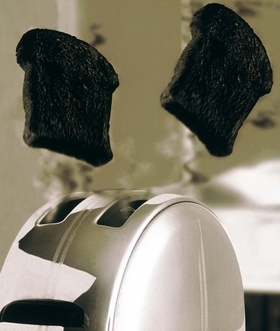 Beware the burned toast, U.K. scientists say. Charred food may be one of the latest fads at fashionable restaurants—at least according the New York Times food section—but there seems to be a dark side to this trend. Government food scientists in the United Kingdom are warning of cancer risks if you prefer your starchy foods extra crispy. Preliminary research on animals has shown a link between acrylamide—a chemical produced when starchy foods are roasted, fried or grilled too long at a high temperature—and cancer. The highest levels of the substance are found in foods with high starch content that have been cooked above 248 degrees Fahrenheit, such as chips, bread, breakfast cereals, crackers, cakes and coffee beans. Animal testing has shown that acrylamide is toxic to DNA and leads to cancer. Many scientists postulate that the same might be true for humans, although there is not yet conclusive evidence. These findings have led the U.K.'s Food Standards Agency to recommend small dietary changes to limit your intake of acrylamide. Primarily that means settling for food cooked to a golden brown instead of dark brown or black, especially when preparing such foods as potatoes, bread and root vegetables. The FSA has said that it is not clear exactly how much acrylamide can be safely tolerated by humans, but it does believe we are eating too much of it. Many are not convinced there is danger to having a dark roast coffee with extra crispy toast. “Even adults with the highest consumption of acrylamide would need to consume 160 times as much to reach a level that might cause increased tumors in mice,” said David Spiegelhalter, professor for the public understanding of risk at Cambridge University.